What devices are your high-tax lines? Your low-tax lines? Which lines have data, text, and other feature taxes? Are you paying the correct taxes? Have users moved, and do you have the right addresses on each line? 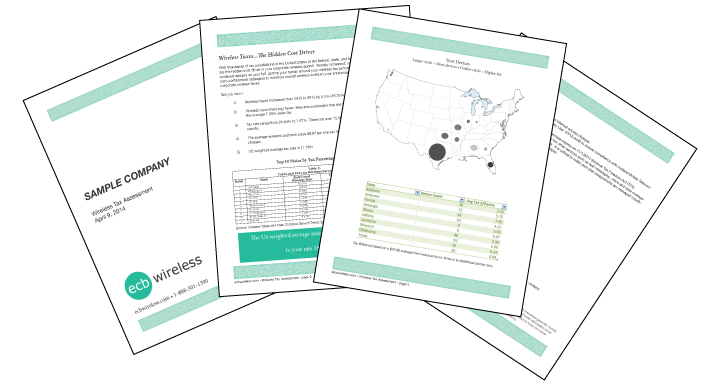 If your company is going to be “best in class” in regards to wireless costs you will need to address the costs associated with wireless taxes. We are the only company in the wireless industry that has a solution that will lower your tax liabilities by up to 20-40%. The customers that allow us to explain our offering are blown away by the power of what we have developed. These are just a few examples that demonstrate the variance in tax rate charged by each state. Please visit www.mywireless.org to get the tax rate for your particular state.